Step 1: Get a big stack of cash. There's no credit here in Ghana and not many people use checks. You can get a loan, but the interest rates are super high. 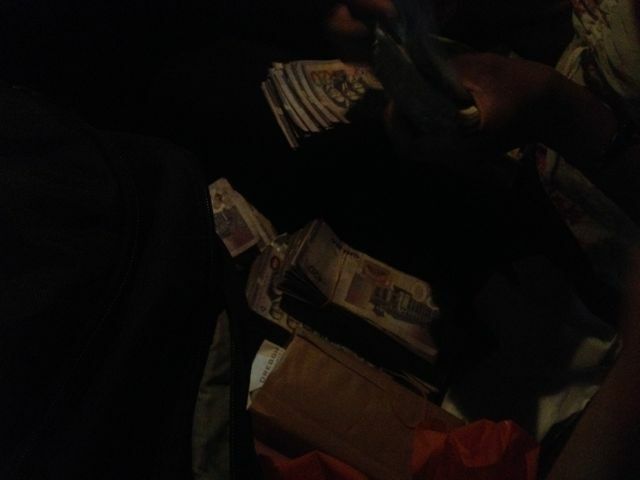 I brought some cash with me to exchange for Ghana Cedis but had to get the rest from the ATM's. It took several weeks because I could only take out $400 per day. It got to be a mundane routine of going the get a wad of cash everyday. I did figure out that the Commercial Bank of Ghana gave the best exchange rate along the process. 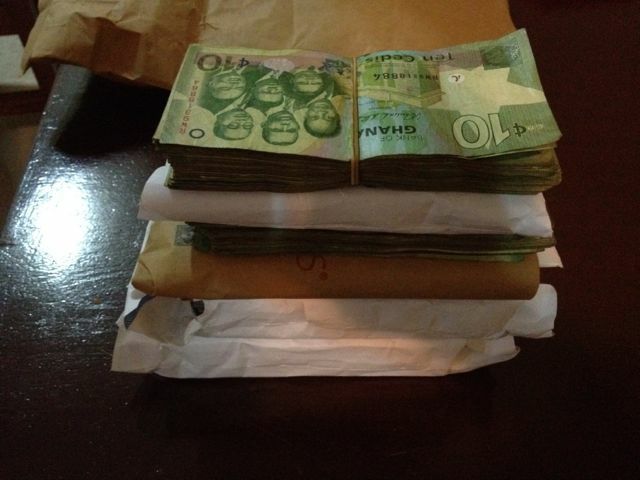 I got together about 15,000 Cedis or around $7,500 Dollars and I was ready to go. Step 2: Look for a car. This is the hard part, they're everywhere even online and you can go crazy just looking. 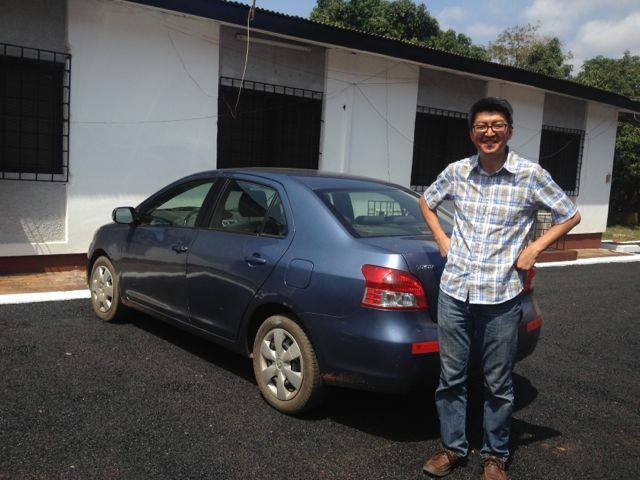 There are also used car lots which are a bunch of cars parked on the side of the road in a dirt field sometimes. Unlike the states, there are a lot more obstacles to deal with. For one thing, cars are not manufactured here so every car on the road was shipped hear new or used. Market value is a bit higher since there's a duty to pay for every car that enters the country. The duty is based on value but more significantly on fuel efficiency. So an SUV will have a higher duty than a compact. A lot of cars come from the US and Canada but you also get a lot from Europe and Asia. By far the most popular brand is Toyota. I'll be selling my car before I leave so I have to think about getting something that will sell easily and also something that can be repaired with little problems. So Toyota it is. Closer inspection revealed a really bad paint job. A lot of cars look good from afar, but not up close. Drove well, but had too many miles, AC wasn't working and wasn't registered yet. Step 3: Start making phone calls. This part gets weird because of the different personalities and the local accent. My phone is not so good as well so it became a challenge to communicate with the sellers. This is where I instituted help from the nearest Ghanaian that in my immediate vicinity during phone calls. When I couldn't understand what the people on the phone were talking about, I would ask someone I knew to talk with them. It made things tedious but it really helped to figure things out. Step 4: Check out some cars and take them for a test drive. Bring a local friend to help with the language and also to be your wing man so you don't make a stupid impulse buy. This is not my first used car purchase but my first in this country. I tried a few times to get help from a mechanic, but with the way things go here in Ghana it was logistically very difficult to to arrange a meeting of all parties involved. So all of the cars had some issue or another because the price range I was looking at wasn't going to yield something perfect or clean. Just about every car has some body damage and any attempt to repair them is very noticeable so you just have to live with it. Mileage doesn't mean as much here but what does matter is how long the car has been registered in this country. The roads here are very very rough, so the less time it's been driven here the better. I was looking for something that had been registered no longer than two years. I checked out a Toyota Corolla, two Pontiac Vibes (based on the Toyota Matrix) and a Toyota Yaris. I chose the Yaris. In hindsight I might have been better off looking at more vehicles but the Yaris had a pretty solid engine with good suspension, clean fluids and I was getting tired of searching. Step 5: Make the deal. This is where you need to bring your mad negotiation skills, or bring a local. I chose to bring one of my students who had recently make a purchase himself. After some negotiations we came to an agreement on price. We managed to talk them down a bit. I was happy with it. So we had to drive to a different neighborhood to get the paperwork. It took us about 45mins to get there due to traffic and this is where my friend got a little nervous because it was dark (sun sets here at 6pm everyday) and we were going to an area we weren't familiar with. The owners were a young couple. The gentleman worked in IT and his wife who drove the car was a grad student at the University where I found the car. I didn't feel threatened in any way but my friend Denice decided that we should wait for them at a public place while they retrieved the paperwork so we pulled over at a filling station and waited for them to come back to make the deal. This was probably a good idea since I was carrying around $7,500 in cash in my backpack at the time. After a few minutes they arrived and we made the transaction. It took about 10 minutes for her to count the money in the back seat while we looked over the paperwork to make sure everything was in order. The couple I bought the car from at a filling station in Accra. Most important step is to buy Denice a chicken and jollof rice dinner at the mall after the deal. It was dinner time and we were both hungry. Step 6: Drive home in your new (used) car. On the way home buy your friend a chicken and jollof rice dinner at the mall. Step 7: File a transfer of ownership form at the DVLA (Driver and Vehicle Licensing Authority) downtown. This is still in the works and has it's own complexities. The DVLA is usually very crowded and slow so I have a friend of a friend who has a little kiosk outside the DVLA. They know people inside the DVLA so they can get expedited service for you if you tip them so I left my application form with a deposit for them to process. This takes a day or two but it beats waiting in a crowded room for most of the day. The final step is to pose like an old man in front of your vehicle and mutter something about "kids these days."